With the rise of the global environmental movement, citizens (=consumers) need to be responsible consumers. 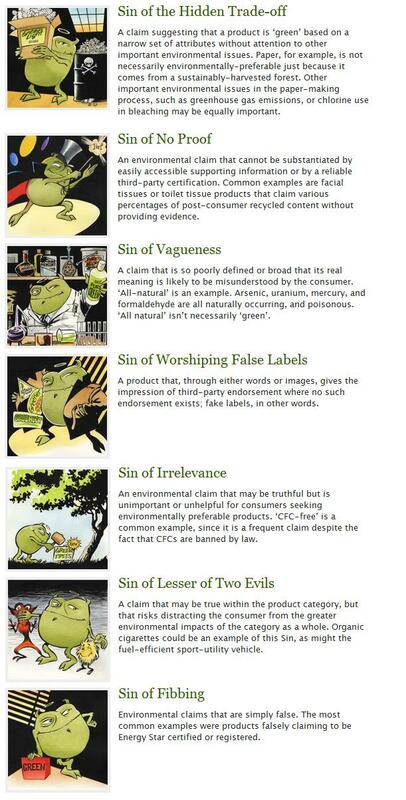 The seven sins of greenwashing, developed by TerraChoice has the purpose of “maintaining the pressure for truth and clarity in environmental marketing”. Green-wash (verb): the act of misleading consumers regarding the environmental practices of a company or the environmental benefits of a product or service. Creditability is important, but then knowing what the rules that define some of the green designations need context and appreciation.